Melt the ghee in a pan, fry the cashews, raisins until they turn golden the raisins fully puffed up. Remove from the pan and keep it separately. Add the grated yellow pumpkin to the same pan and add little more ghee. Saute the pumpkin on a slow flame continuously to get rid of the raw smell for 10 minutes. Slowly add in the milk to the sauteed pumpkin and mix well. Cover and cook for 2 more minutes on medium flame until the liquid dries and just turning dry. Now add in the sugar and combine well. 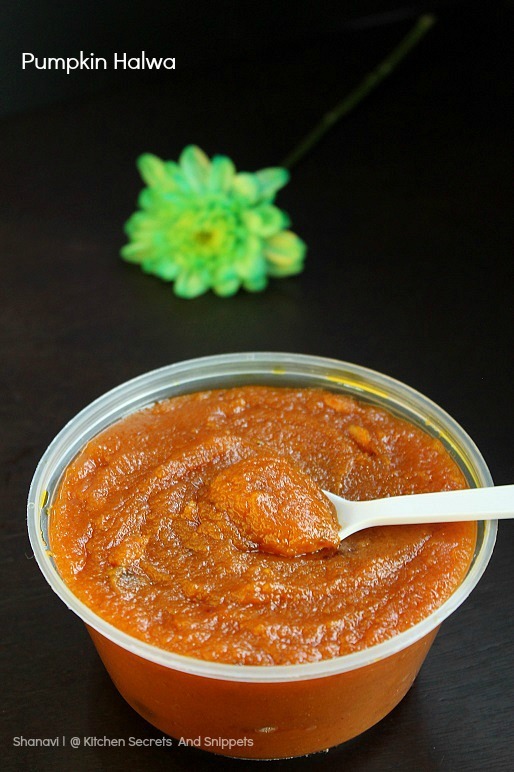 Now the halwa might seem watery, so don't bother, just keep on stirring adding ghee every now and then. Add the khoya to the halwa and stir until they mix well with the halwa. Now add little more ghee to the halwa. 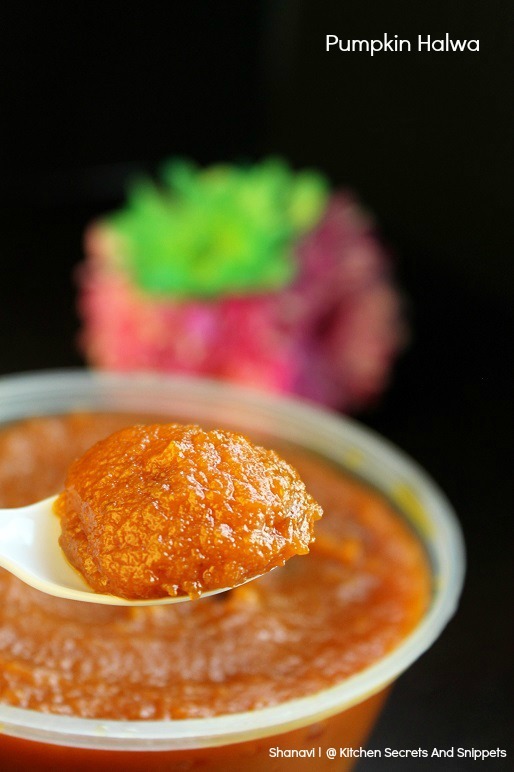 Add the colour powder to the halwa, mix thoroughly until it is thoroughly combined. Finally add the fried cashews , raisins and cardamom powder to the halwa and stir well. Keep on stirring the halwa until it starts leaving the sides. I kinda minced the yellow pumpkin and made the halwa, thatz y the texture is different. Also I've used colour powder to get the traditional colour of halwa. U may add condensed milk instead of milk and khoya, still the taste would slightly differ. 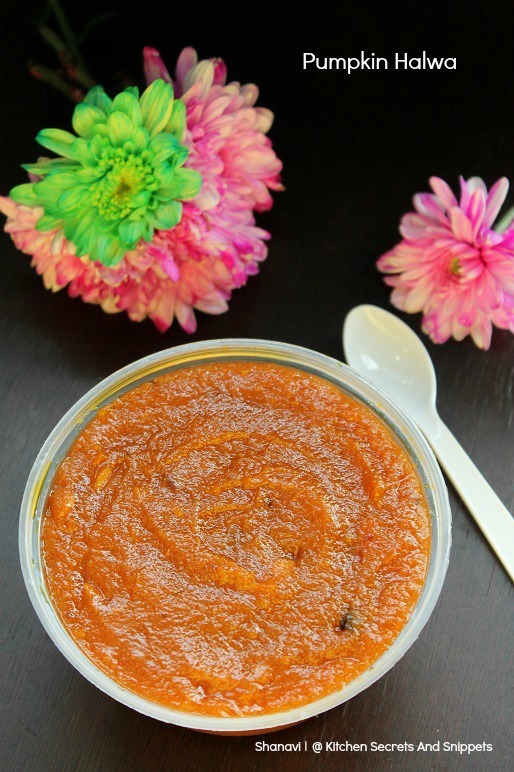 delicious superb and lip smacking pumpkin halwa. oooh my oh my...i just want to have some right now..looks so yummy..